Menu and Medications. Meadowsweet Pet Boarding and Care. Wilmington, N. C. 910/791-6421 Boarding dogs, cats, puppies and kittens. Meals are provided by MeadowSweet and are included in the boarding rates. Alternatively, you are welcome to bring your pet's own food to be fed per your instructions at no extra charge. All food must be brought in airtight containers or resealable bags. MeadowSweet provides morning and even feedings. We will accommodate additional feeding requirements at no extra charge. 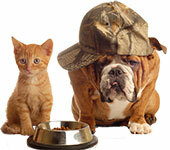 We will be happy to discuss your pet's specific feeding requirements at check in. Should the administration of medication be required during your pet's stay, in most cases, MeadowSweet will do so at no additional charge. All medications and their respective dosing regimen or application will be discussed with you at check in. Please bring all medications in their original prescription packaging. All your pet's medical needs are carefully computer monitored.